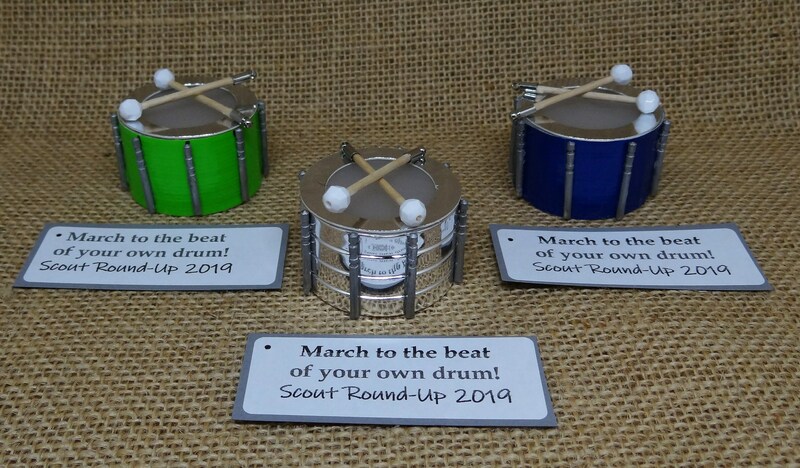 For sale are ten (10) Drum and Drumstick Scout SWAP or Craft Kits. March to the beat of your own drum! Music makes the world go round! Give me a beat! These miniature snare drums with drumsticks can be used to recognize a wide variety of musical adventures: earning a music badge, attending a concert, learning an instrument, marching in a band, and so much more! You can also use this SWAP to celebrate diversity and being the one and only you! These kits come in four color options: 1) silver, green, blue, or mix 'n' match. Each SWAP kit includes all the supplies you need to make a miniature snare drum complete with drumsticks. These SWAPs look so realistic when complete. JUST ADD GLUE.